The following table lists NSW high schools based on the number of First Place (in Course) achievers in 2018 HSC Course only. Find best high schools in Sydney or top schools in NSW here. 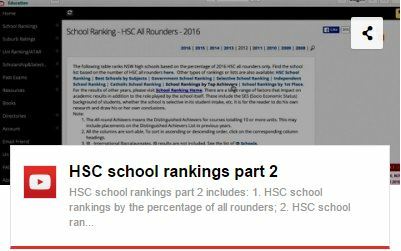 Related: Find HSC first place (in Course) achievers by course name, student name or school name. Other types of rankings or lists are also available: HSC School Ranking | Government School Ranking | Selective School Ranking | Independent School Ranking | Catholic School Ranking | Best Schools by Subjects | Schools Sorted by by All Rounders | Schools Sorted by Top Achievers | For the results of other years, please visit School Ranking Home. There are a large range of factors that impact on academic results in addition to the role played by the school itself. These include the SES (Socio Economic Status) background of students, whether the school is selective in its student intake, etc. It is for the reader to do his own research and draw his or her own conclusions. The definition of 'First Place in Course' is available from First Place in Course List. To find more details of a school, click the school. Most of the links will redirect to the corresponding school listing page.